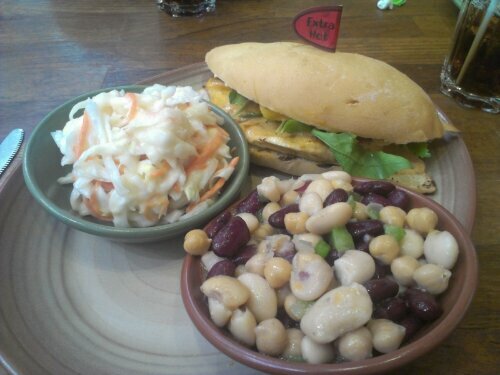 Nando’s @JCube (Singapore) | Get Your Grub On! Another day, another lunch. Somehow this week we felt like something new and so again today we tried a place we haven’t been to before – ‘Nando’s’, a Mozambican-Portuguese franchise restaurant at JCube mall next to Jurong East MRT. We all decided for a variation of the ‘Angry Mango Chicken‘; Wrap, Pita and my choice, the burger with their signature ‘Extra Hot Peri Peri Sauce‘. As my two sides I had the ‘Coleslaw‘ and the ‘3 Bean Salad‘ which both were more boring than anything. The coleslaw was slouchy and missing crunch and both salads lacked a good pinch of salt which might have saved them from falling under the ‘lame’ category. The chicken was not so much a burger as a sandwich. The bread was more baguette like but very soft and as they meant good with the sauce also completely soaked. The chicken itself was quiet nicely grilled, not particularly moist but tasty nevertheless. Together with the greens and the peri peri sauce it made quiet a good combination, just the mango wasn’t really that present. The sauce tricked me at first as it appeared tangy yet not biting which changed like three quarters through the sandwich when I started sweating and had to breath with open mouth. Tasty though. Even that this is not the place I would go the extra mile for it sure is a decent place for a lunch change once in a while. And next time I might try the pita version as that actually looked really toasty.